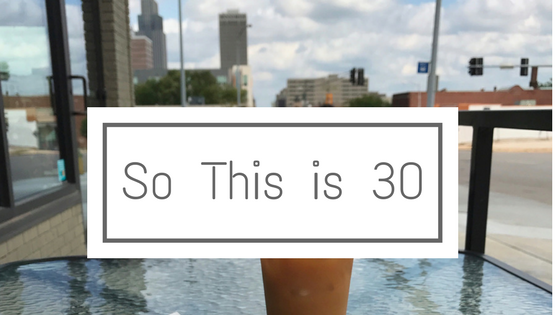 At the risk of being written off by all those wise women and men who are further down the road than me, and at the risk of being written off (or mocked) by all those who are still young and cool, I’ve decided to write what it feels like—to me—to be turning 30. THREE ZERO. Such a round, full, even number. So plump and sophisticated. Yet I only seem to embody that first word. My twenties felt a little like a roller coaster, and I was ok with that. We moved many times, I said goodbye to my parents as they moved overseas, I birthed two babies, lost my grandmother and my aunt, served in leadership at three different churches, and generally thought someday I would feel like I’d arrived somewhere. But I didn’t feel pressure to already be there. After all, I was young! I had plenty of time. I began to see grey hairs (yes, thanks to genetics, I began going grey at what many would consider too young an age). At first I was appalled, and then I decided that after years of being condescended to, I would embrace the life and experience these grey hairs symbolized. I earned every single one of them. I would own them. I saw 30 approaching out of the corner of my eye, and honestly, I was thrilled. Those of you who share my love of cheesy Jennifer Garner movies will understand: “thirty, flirty, and thriving.” I was not apprehensive in the least, and I welcomed that number which would possibly lend me some credibility, some stability, and some excuse for not looking like a Forever 21 model (God help us all). So you can imagine my shock when I got to August 26, 2017, and did not feel totally fulfilled, confident, and ravishing. Um, excuse me? Did I miss something? Isn’t this supposed to be the magical age where I finally have it all figured out, and my life is on a “successful” trajectory (whatever the heck that means). Aren’t I supposed to feel more confident than ever in my strengths, and more full of grace for my weaknesses? Isn’t this when I stop feeling like I’m slugging through mud up to my waist and I’m now running speedily and gracefully down a beach like a Baywatch star? I feel cheated. And a bit…disoriented. Now’s the time when you'd point out how dramatic I’m being. And you’d be right. But, to be fair, I also spent a lot of my young adulthood hearing gasps at how young I was to be doing what I was doing. I was told (falsely, I think) many times how “mature” I was for my age. Hogwash. Thirty seems to carry some weight. This stage in life seems to come with some…expectations. I’m not even precisely sure what they are, and they’re probably all in my own psychotic head, but I feel them. I have a vague sense of somehow not being as far along as I should...As if maybe I should have already “achieved” more (or anything at all, really), or that maybe I shouldn’t still be coming up against familiar struggles. I don’t think I’m the first 30 year old to feel this way, and I have a hunch I won’t be the last, so in case this helps anyone else out there, I’m going to share some really wise words with you. **Don’t worry, they’re not my words, because I have none on this subject, clearly. ** They are from a woman I admire greatly, and who also happens to be my best friend: my mother. So there you have it. I’m 30. I have arrived exactly nowhere. I don’t have many answers, and I still have a lot of struggles (including the aforementioned "real pants" thing). But I’m going to fight every day to stay fully awake. I’m going to stay alert, not just for what I’m called to do in the world, but for all the reasons to celebrate and give thanks. I’m going to look around at my messy life, and enjoy it fully. I hope you’ll join me. No matter how old you are.